Absorbing the role and functions of the former Digital Transformation Office (DTO), the Digital Transformation Agency (DTA) was established on 27 October 2016. An executive agency under the Public Service Act 1999, the DTA is a non-corporate Commonwealth entity subject to the Public Governance, Performance and Accountability Act 2013 (PGPA Act). Placed in the portfolio of the Prime Minister and Cabinet, the DTA is accountable to the Prime Minister, through the Assistant Minister for Cities and Digital Transformation. The agency does not administer any legislation. Working in partnership with other agencies, the DTA’s mission is to enable the transformation of government services to better meet user needs. The DTA is also tasked with making the benefits, costs and risks of the government’s ICT and digital investments more transparent. The DTA is not responsible for the delivery of every ICT and digital project across government. Departments and agencies are responsible for developing and implementing these projects. The DTA’s first structured planning and reporting framework was introduced in March 2017. Identifying the agency’s vision, values and immediate strategic priorities, the Corporate Plan will continue to be developed during 2017–18. The DTA supports government digital transformation through policy leadership, product delivery, program management and building capability. This is mandated by an establishing order and guided by program outcome. advocating within and beyond government for ICT and digital transformation. The DTA designs and delivers digital services using Agile methodologies. This approach allows teams to respond to unpredictability by working in short ‘iterative’ and ‘incremental’ stages. Define a minimum viable product from the successful prototype in Alpha. Build this as an accessible and secure service. Allow the public to trial the beta alongside the existing service. Use their feedback to improve the service. Put the team and processes in place to continue operating and improving the service. Phase out the old services, and consolidate existing. Australia’s digital transformation agenda focuses on reforming policies and processes to improve the way government interacts with and provides services to users. While the DTA has been assigned leadership responsibility, the agenda is owned by all federal government agencies. Agencies are accountable for planning and delivering their ICT and digital projects. Services they provide are expected to align with other whole-of-government reform agendas. With its renaming in 2016, the DTA’s role in overseeing and assisting agencies with transforming digital services was expanded. This enabled the DTA to contribute expert assistance and professional advice earlier in the life of projects, as well as giving greater transparency to ICT and digital investments. The DTA used this foundation to create policy and standards, develop best practices and boost digital leadership, capability and culture across government agencies. Some achievements during the year reflect work done over the life of the agency as both the DTO and the DTA. As part of its expanded remit in October 2016, the DTA was tasked with reviewing large new proposals for technology investments to make sure the government gets best value for money and delivers real benefits to users. In November 2016, the Digital Investment Management Office was established within the DTA to carry out this function, and conduct a Digital Investment Review. This examined, for the first time, the costs, progress, benefits, and potential risks of all federal government ICT projects worth more than $10 million. 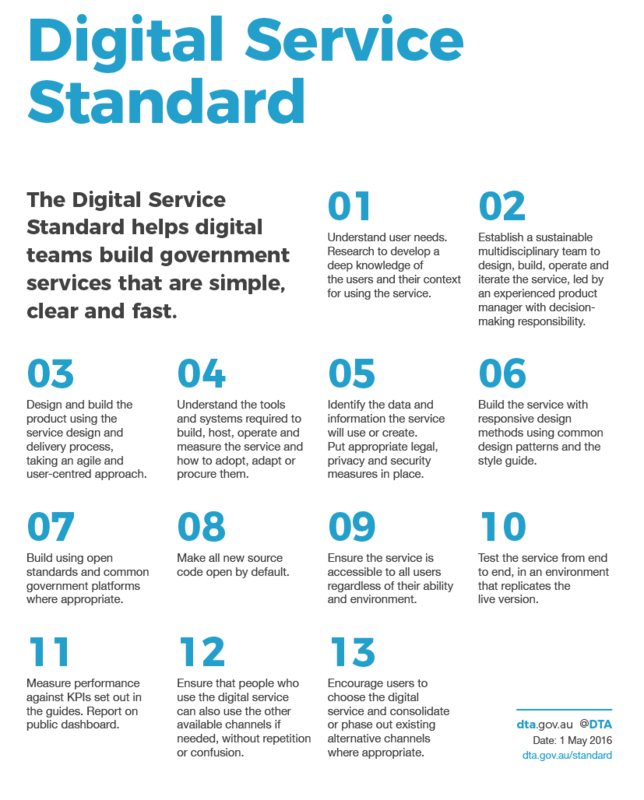 The Digital Service Standard went live in May 2016. It is a best-practice framework that ensures digital teams across the Australian Public Service (APS) build government services that are simple, clear and fast for all users. During 2016–17 the DTA worked with agencies to meet the standard, provided guidance, training and advice to assist them to upskill staff and increase their digital capability to develop and redesign their services in-house. Under machinery-of-government changes in 2016–17 the DTA was given expanded responsibilities around the procurement of ICT products and services. On 15 December 2016, responsibility for whole-of-government ICT policy and strategy functions were transferred to the DTA from the Department of Finance. Administrative responsibility for an ICT Procurement Taskforce transferred from the Department of Prime Minister and Cabinet to the DTA in February 2017. From 18 May 2017, whole-of-government ICT coordinated procurement functions also moved from the Department of Finance and integrated into the DTA. This brought responsibility for overseeing procurement processes across government as well as government panel arrangements, including for cloud services. An expansion to the DTA’s Digital Marketplace was announced on 23 February 2017. The marketplace is an online platform where government agencies can readily procure digital services and where industry sells their digital services to government. Through ongoing work on the Digital Marketplace, the DTA continues to remove barriers to doing business with government. Prior to October 2016, the DTO worked with other agencies to deliver six exemplar services, demonstrating methods for achieving digital transformation and embedding the Digital Service Standard within agency projects. Throughout 2016–17 the DTA continued working collaboratively and providing expert advice, undertaking partnerships on strategically significant delivery projects with a number of agencies. These partnerships aim to avoid duplication, improve uplift of digital capability, increase cost effectiveness and enable better integration of services across government. The Digital Roadmap provides a framework for describing how the government’s digital initiatives will make it easier, simpler and faster to access government services. The aim is to enable people to interact with government as a whole, without having to understand the services provided by individual agencies. A Digital Transformation Vision and Roadmap, prepared by the DTA in collaboration with other agencies, was published in December 2016. The roadmap sets out the vision, user experience shifts, key pieces of work and timelines for the government’s transformation agenda over an 18-month period. This work will continue in partnership with agencies across government. The DTA works with agencies to deliver whole-of-government digital platforms. Providing common solutions means that agencies don’t need to reinvent individual systems. Shared platforms also reduce maintenance and support costs. Between June and December 2016, the whole-of-government Digital Platforms Taskforce developed a strategy and concepts for four digital platforms. The taskforce identified mitigation strategies for barriers to whole-of-government collaboration, including those in governance, funding and delivery. Additionally, the DTA developed design solutions and obtained funding to build the four new platforms, with work starting in the next financial year. In March 2017, the DTA embarked on a Discovery process for a secure cloud strategy in consultation with 26 other agencies, industry and key policy stakeholders. The completed strategy will make it easier for agencies to use cloud technologies, adopt best practices in releasing software and simplify the security accreditation process. Since October 2016, the DTA has undertaken extensive consultation with agencies about a realistic and cost-effective approach to achieving a whole-of-government content strategy. 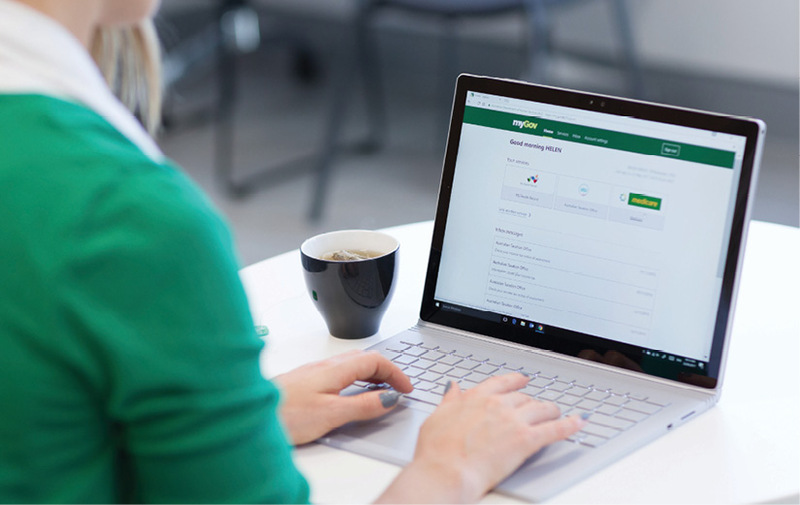 Building on the research and learning from the GOV.AU project, the DTA is working with agencies to bring a greater level of consistency to government websites. In March 2017, a content strategy working group was established by the DTA. The working group is made up of members from federal, state and local governments. Membership is by nomination from agencies with a common interest in delivering simpler, clearer and easier to use government services. Caption: release of myGov 2.0. From 1 July 2016, oversight for service strategy, policy and user experience of the myGov digital service (myGov) was transferred to the DTO. This included any changes to myGov service capabilities relating to policy objectives or user needs, and the on-boarding of new member services. Responsibility for myGov’s operational design, development, build, performance and the operation of the myGov shopfronts remains with the Department of Human Services (DHS). A project to modernise myGov was established in late December 2016. The first stage focused on improving the look and feel of myGov and the user experience across a range of devices. A new site, featuring simpler language, larger logos and a more mobile-friendly design, was launched on 20 May 2017. New governance arrangements were developed by the DTA and DHS, and put in place through the myGov Governance Board. 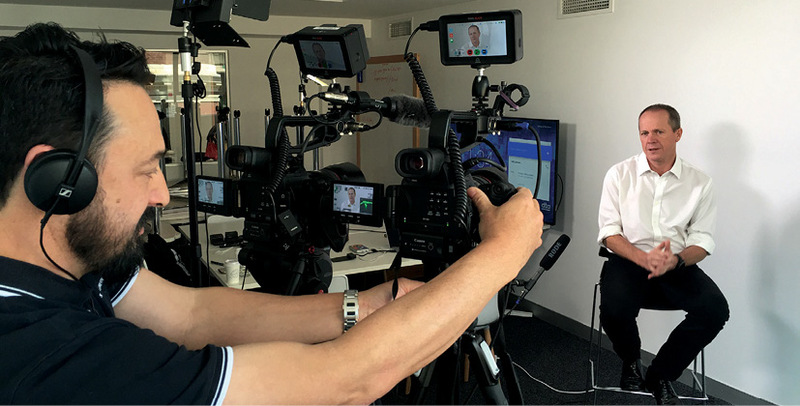 During 2016–17 the DTA continued work on a national digital identity solution. This program of work, GovPass, aims to improve the user experience of identity verification when dealing with government services. In the initial stages of the program, user research was conducted with more than 500 members of the public, as well as with privacy groups and government agencies. GovPass will deliver a framework, rules and guidelines for the operation and management of a secure digital identity solution in Australia. The Digital Identity Governance Committee was set up to oversee the GovPass project. In line with criterion 11 of the Digital Service Standard, product teams are required to measure and report on the performance of services under development. The DTA has developed a performance framework and dashboard platform to help agencies to meet criterion 11. The Performance Dashboard helps agencies to measure the performance of their digital services against specified criteria and publicly report the results. The DTA also works with product teams to publish other outcome-focused metrics to their dashboard. A dashboard to measure the DTA dashboard’s own performance was released on 2 February 2017. As more high volume digital services become subject to assessment against the standard, the number of services publishing performance information to dashboards will grow. The DTA has released self-service tools to meet this need and enable other agencies to maintain their own dashboards. In collaboration with the Australian Public Service Commission (APSC), the DTA has responsibility for making digital skills a core capability of the APS. This collaboration aims to make the APS less exposed to increasing market rates, avoid the high costs of relying on contractors and to reduce design and delivery risks, as well as unlocking further potential for innovation. Open source code repositories to share features and ideas between developers. DTA staff embedded into agency project teams to assist with transformation and transfer skills. Digital transformation education and awareness programs. Entry-level recruitment programs for apprentices, cadets and graduates focusing on areas where there are known skills shortages. The process of recruiting trainees for the largest intake yet in 2018 began on 6 March 2017. The DTA has a team of communications and engagement specialists who work with all DTA teams to provide strategic advice, communicate the agency’s work, undertake issues management and media liaison, manage the agency’s visual identity, website, and social media channels. During 2016–17, we reviewed and improved the way we engage with government and industry. The team works to better coordinate engagement activities across the DTA and provide a consistent engagement experience for stakeholders. 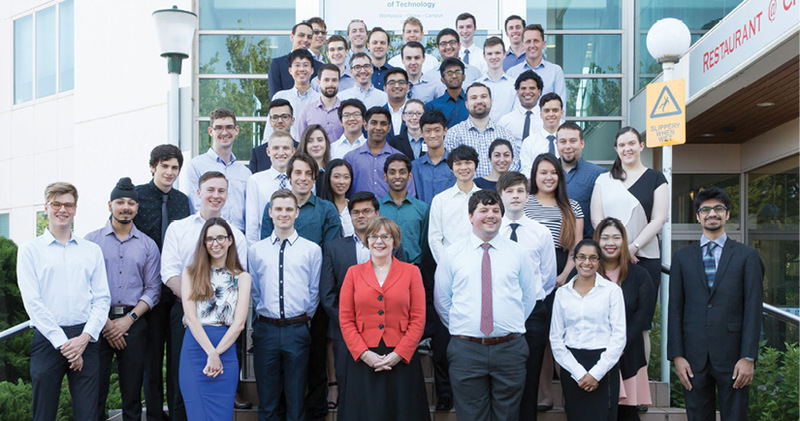 DTA staff sit on a large number of forums and committees both in Australia and internationally to share information and learn about successful digital transformation efforts. The agency performance statement is at Appendix B. 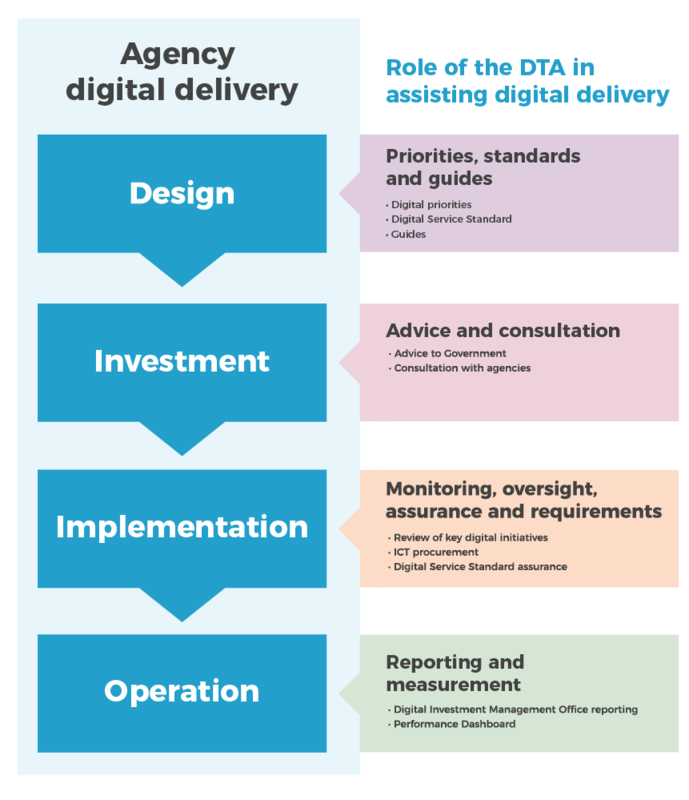 An overview of the Digital Transformation Agency. A review of our management and accountability in 2016–17.